Colebrook Blackwood Reconciliation Park is where the Colebrook Training Home once stood. It is now a permanent memorial for the Aboriginal children of the "Stolen Generation" and their families. 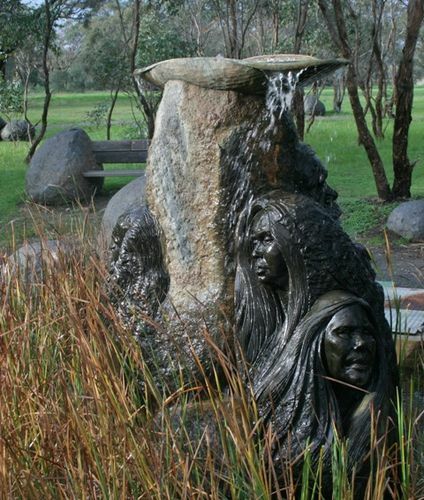 Through the untiring efforts of the Colebrook Tjitji Tjuta, the Blackwood Reconciliation Group, the Aboriginal Lands Trust, and other groups and agencies, to remember the Aboriginal children of the Stolen Generation, the 'Fountain of Tears' (1998) and the 'Grieving Mother' (1999) statues, sculpted by Silvio Apponi, have been created. In May 1927 the Sisters moved to Quorn where the house they lived in became known as the Colebrook Children`s Home, after the President of the UAM. The children placed at Colebrook included those who had been forcibly removed from their parents by government officials, some who were placed there by their traditional mothers or non-Indigenous fathers because one or both parents were unable to care for them and those who had been taken from their families by non-Indigenous people to work for them and then rejected when their services were no longer wanted. Once children had been admitted to the Home, it was almost impossible to have them taken out by their parents. It often meant that the parents had to pay a substantial amount of money and were subjected to some harsh conditions before the Board would even consider their requests. Let everyone who comes to this place know they are on Aboriginal land. The site of what was once Colebrook Training Home where between 1943 and 1972, some 350 Aboriginal children lived, isolated from their families and the beloved land of their ancestors. This is part of the country of the Kaurna people whose heritage and presence continues today. We are the stolen children who were taken away torn from our mothers` breasts. What can a child do ? Where can a child turn ? Where is the guiding hand a child is meant to have ? Former Resident Of Colebrook Home. Photographic Montage by Rick Martin. Colebrook Home began with the United Aborigines` Mission in 1924 in Dunjiba (Oodnadatta). Then in 1927, it was transferred to Quorn in the Flinders Ranges, with 12 children cared for by Sister Ruby Hyde and Sister Delia Rutter, In 1943 they moved here to Eden Hills. Sisters Hyde and Rutter were each awarded an MBE for their unselfish devotion. They left in 1952 to establish Tanderra Hostel, and the succession of Superintendents who followed them at Colebrook Home enforced a strict discipline. Many of the children had been removed from their families under the Government's policy of assimilation, some never to see their parents again. "Colebrook started with Sister R. Hyde and Sister D. Rutter. They were Colebrook. What we had was constant love and attention from these two remarkable ladies. After they left, those kids went through hell on earth. They had to rely on each other to survive." Faith Thomas, former resident of Colebrook Home. "And every morning as the sun came up the whole family would wail. They did that for 32 years until they saw me again. Who can imagine what a mother went through ? But you have to learn to forgive." The Pool of Tears remembers the grief of the families of those Aboriginal and Torres Starit Islander children taken away as a result of the policy of forcible removal of indigenous children. This memorial is a joint venture of the Colebrook Tji Tji Tjuta and the Blackwood Reconciliation Group in collaboration with the Aboriginal Lands Trust, Aboriginal Sobriety Group and the City of Mitcham. Funding assistance from Arts SA, the Australia Council for the Arts and from the voluntary donations of thousands of Australians. "My baby, my baby, please give back my baby." A mother`s words fall upon the deaf ears of authority. Hearts break, tears fall, fear cries out from wrenched hands and arms of a mother and child, separated. Feel the pain, touch the ache, caress the tears. Through ignorance and indifference came the disruption and destruction of family life. This monument honours all those mothers across Australia who lost their children to the policies of forced removal. Let it never happen again. Unveiled in Sunday 30th May 1999, by a number of those children. Created by Sculptor Silvio Apponyi, assisted by Kaurna sculptor Shereen Rankine and Yankunjatjara artists, Tjula Jane Pole and Kunyi June-Anne McInerney. Funding assistance by Arts SA, The Australia Council for the Arts, Rio Tinto Aboriginal Foundation, SA Women`s Health statewide and the generous gifts of thousands of individuals.